Sorry for the delay in posting the roundup. I was kind of busy with the Blogging Marathon and so didn't find time to compile and post!! 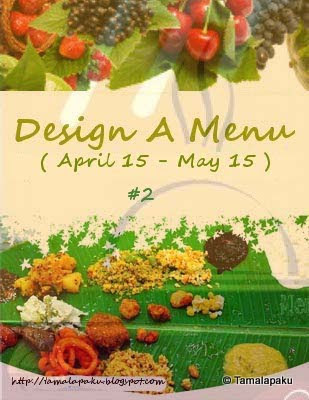 So here is the Round up of the 'Design A Menu - 2'. 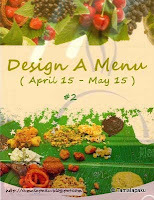 We sincerely appreciate and thank all participants for sending in their creative menus. We understand that the rules of the event might be a little confusing and intimidating too for many of you. Some had a tough time in adhering to the rules. We apologize to some participants whose entries had to be rejected because they didn't follow the rules. To reiterate, you don't have to make all the items from the menu designed. Just cook and post one or more recipe(s) from the menu you have designed. This time around we have a couple of menus from enthusiastic non-bloggers and a special thanks to them as well. All of the menus/entries were interesting and very creative too. So without much ado, lets jump in to see what menus are in store! They are listed in the order we received. Dessert - Godumai Halwa ~ Wheat Halwa, Chocolate dipped Strawberry. 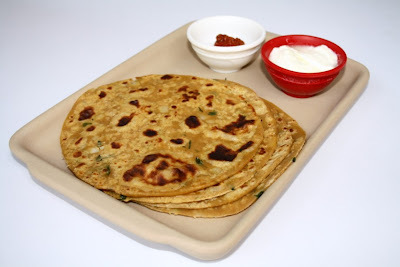 Start by making chapathi dough with pinch of salt and wheat flour. In a wide Pan add 3/4 cups of water set to boil..
Now make chapathi (little thicker than chapathi) cut them in to diamond shapes and place in hot water for 5-6 min to cook. After it is cooked place them in the strainer and run little cold water. This is to stop cooking and sticking together. Add jeera, green chillies,curry leaves then slowly add onions to fry until light golden brown. Then on a low flame slowly start adding methi, tomato for 30 seconds..
No its time to add all wheat pieces into the pan.. stir it very well slowly until everything mixed evenly. Towards the end add desired salt to the taste. For extra touch chopped carrots really brings taste to the recipe with dashing color..
Peel 2 raw mangoes and cut them into 1" long pieces. Slit 8-10 2" green chillies lengthwise and pressure cook these three (mango, methi and green chillies) together and let them cool. Also pressure cook 3 cups of chana dal and half a spoon turmeric with 6-7 cups water till you get 7-8 whistles. For whatever reason, my impression is that chana dal requires more cooking than toor dal, hence so many whistles. Allow it to cool, mix the cooked veggies into this and cook on medium flame. Add salt and red chilli powder as necessary. If you think the mangoes are not as sour as expected, you can try adding some tamarind paste. 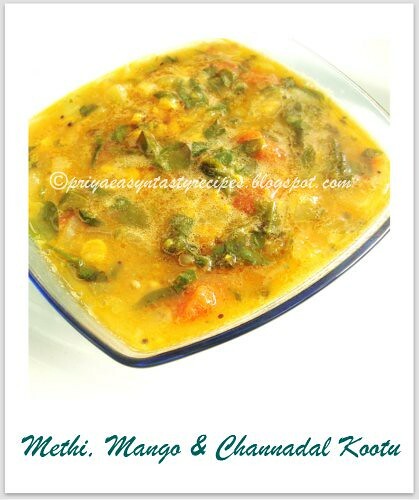 You can also add water while cooking to get the desired dal consistency. In a separate tadka pan, heat 2-3 tsp of oil till the oil almost boils. Add mustard seeds and let them splutter. Add jeera seeds and let them fry for a few seconds, add some hing and then add cut curry leaves. I like to add some split urad dal (minnappappu) into this. After a few seconds, add 8-10(or as necessary) broken red chillies and let them fry. I like to add a table spoon of dhania powder into this as it really gives out some good flavor. Mix this tadka into the dal, cook on sim for a couple of minutes and switch the stove off. In the mean time, cut a handful of cilantro as fine as you can and mix it with the dal, close the lid and allow it to cool for a while so the flavor gets in. The dal is ready now, and it tastes good with either rice or roti. If you want to eat it with rice, fried dahi mirch (uppu mirapakayalu in telugu) and/or vadiyalu (telugu) are/is a good combo. Peel the mangoes, make sure they are decently sour and dice them into 1/2 centimeter pieces. Now, add salt, turmeric, chilli powder, methi powder and mustard powder to this. Methi and mustard powder amounts may vary according to taste, but its usually more of mustard and less of methi. Let this mixture dry marinate for 20-30 mins till all the flavors get in. Meanwhile, heat 4-5 tsp oil in a tadka pan, allowing it to boil. Add 2 tsp mustard seeds and let them splutter. Add hing, let this cool and add this to the above mixture. Serve with hot cooked rice. If you feel the pickle is not sour enough, add a few drops of lemon juice after you mix the pickle with rice. Peel the sweet potatoes and quarter them. Now take a dish with a handle, toss the sweet potatoes in, add some water and salt and boil them for 15 minutes timed on 8 heat, closed. Meanwhile, take a bigger pan, essentially the curry pan and boil 2-3 tsp oil in it. Add mustard seeds and let them splutter, add curry leaves and then some split urad dal and finally if you like, some broken red chillies. Now drain the water from the boiled potatoes into a cup, and toss in the potatoes into the curry pan. Saute for a while on medium heat till the potatoes get brown and add some turmeric. Cover cook them covered for 5-10 mins on 7 heat, occasionally checking on the potatoes. If you feel they are too dry, sprinkle the drained water you saved earlier. Add salt and chilli powder as per your taste. You can add crushed red peppers instead of chilli powder. The water I asked to save before is assumed to contain a lot of the nutrients from the potates. So, decide on the right amount of water to cook the raw potatoes with, so when you drain and save, it is just enough to use in the curry later. Bring milk and sugar to a boil in a heavy saucepan on medium heat. Take 100ml of milk aside, add custard powder and mix it well so no lumps exist. Add this to the boiling milk and keep stirring. Cool it down when you get a thick pouring consistency. De-seed the strawberries and dice them in a container. Pour the custard over onto them. Alternately, you can garnish the custard with these strawberry pieces. You can also add various nuts as garnishes. Serve chilled. You can add a variety of other flavors to this custard, so feel free to experiment with banana, almond, chocolate and any other essences you can think of. Thanks once again to everyone. For more details check the announcement here. 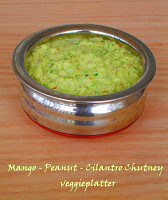 Coconut-Mango Chutney is a classic Chutney and a very traditional one at that. In many religious homes coconuts are offered every other day to God and so there would be loads of coconuts at home any time of the year. So this chutney was prepared very often at my grandma's place. But I guess the taste of the chutney made in the typical Indian style mortar-pestle is out of the world!! This reminds me of what my mom told me the other day about the scene regarding coconuts in my paternal grandparent's house(about 50-60 years back). In their house, they never broke any coconuts at home as my paternal grandpa was more of a practical person and less religious, so to say ! Apparently my grandma used to send all the kids to the nearby temples to get some extra broken coconuts for a paltry sum and used to make many delicacies including this chutney. Another thing is that they used the rock salt (Ralla Uppu) and not the current day processed powdered salt. I definitely think that the rock salt imparts a special taste to anything in which it is used. My mom still uses the rock salt at home. I wish we could do the same here too!! Here is the recipe for Day 7 and that brings us to the end of this edition of Blogging Marathon which we thoroughly enjoyed. Thanks once again to Srivalli who organized this marathon. We are surely looking forward to the next edition. In a heated sauce pan, add oil and the rest of the seasoning. Just about when the dals begin to brown, add the green chillies and saute for a few seconds. Add the grated coconut and saute for a minute or so and switch off the flame. Mix in the grated raw mango in the warm sauce pan and gently mix. Add the chopped coriander leaves and grind the mixture upon cooling, adding salt as needed. Please note that if the raw mango is not sour enough, feel free to add a little tamarind juice when grinding. Some might like to add extra seasoning(tadka) to have a crunch of the dals. Serve it with hot steaming rice and ghee and experience the 'divine' taste!! Here are my previous posts under the 'Regional Recipes' for this week of Blogging Marathon. What would you do if you have unexpected guests for dinner? I am sure we would be comfortable in whipping up a three course dinner in a matter of minutes what with the modern gadgets like refrigerator, microwave etc. But imagine the predicament of our grandparents and people of the older generation. No electricity, no modern gadgets - just creativity and hard work, right? Same was the situation with my grandmother. Their household was one of the prominent ones in town, well known for their hospitality and good food at any time of the day/night. My grandma says, on any given day, they would have at least 3-4 unexpected guests for lunch or dinner. She says they would all be well built and massive eaters. On a festival day when there are many special items made, each guest would approximately eat about 2-3 pounds of rice, 20-30 vadas, 1 pound of Dal, 10-12 bobbatlu/holigalu/polis, all this apart from chutneys, curries and curds. Imagine feeding at least 40-50 guests with that appetite :) Also count in the regular household members about (20-30). She would have about 2 helpers in the kitchen and she would have to take care of the entire household, the issues with the workers in the farm, issues with the cattle, kids etc. In those days, they would buy fresh vegetables for the day, flowers for prayer every morning from vendors who step in. Given the above context, she has to take refuge in recipes like this Alu perugu pachadi when all you have at the end of the day are some leftover vegetables, some potatoes for sure. And since they had lot of cattle, milk and curds were always available. To me this explains the simplicity of this dish! Anyway, here is the simple recipe of perugu pachadi / raita. In a bowl, add the coarsely mashed potato, salt and curds. Mix well and add chopped green chillies if using. In a small pan, heat oil and add the rest of the seasoning. After the mustard seeds pop and the dals are brown, remove from fire and add it to the alu-curd mixture. Garnish with chopped coriander leaves (which I didn't) and serve with pulao or plain rice. My mom says this pindi miriyam is sometimes made without the Toor Dal and that also tastes very good. So here is the version of pindi miriyam which is popular in our families for Day 5 of this marathon .. Boil the all vegetables except tomatoes and toor dal separately in a pressure cooker until cooked well. [I like to cook the vegetables separately in the microwave sometimes]. Meanwhile roast all the ingredients except coconut listed under the 'roast and grind' and grind adding the coconut and water. I also grind a tomato along but that is totally optional. After the pressure cooker is safe to open, mix the cooked dal, turmeric and the vegetables and set aside. In a heated sauce pan, add oil and the rest of the seasoning. After the mustard seeds pop and urad dal is brown, add the dal and vegetable mix. Now add the ground paste, salt and tamarind juice. Let the mixture boil enabling the flavors to blend in. Remove from fire and garnish with chopped coriander leaves. This Goes to 'MLLA - 35' happening at Kannada Cuisine started by Susan. Also sending this to Kiran's 'Cooking with Whole Foods' event happening at Veggie Platter, the ingredient being Toor Dal / Pigeon Peas.